Source Spotlights are often updated as new data become available. Please click here to find the most recent version of this Spotlight, which has an expanded focus on all limited English proficient individuals in the United States. In 2002, passage of the No Child Left Behind Act (NCLB) marked a turn in the nation's approach to educating children who do not speak English well, many of them immigrants or the children of immigrants. "...ages 3 to 21, enrolled in elementary or secondary education, often born outside the United States or speaking a language other than English in their homes, and not having sufficient mastery of English to meet state standards and excel in an English-language classroom." The enrollment data used in this Spotlight come from the National Clearinghouse for English Language Acquisition & Language Instruction Educational Programs (NCELA), while demographic and social data are from the Census 2000 5 percent Public-Use Microdata Sample (PUMS). About five million LEP students were enrolled in public schools in the 2003-2004 school year. 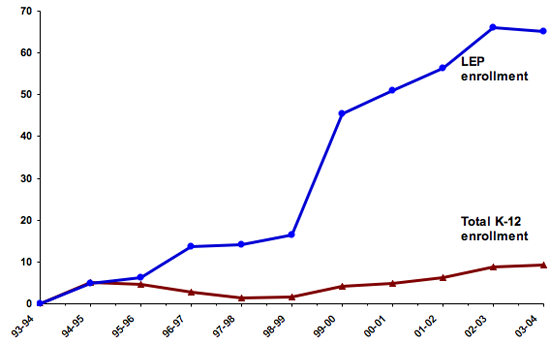 The number of LEP students enrolled in American public schools increased by 65 percent between 1994 and 2004. With nearly 1.6 million LEP students in 2003-2004, California had the largest number in the country. The LEP-student population grew 522 percent in South Carolina between 1993-1994 and 2003-2004. In all households where a language other than English is spoken, the U.S. Census Bureau asks if members of the household speak English "very well," "well," "not well," or "not at all." In this Spotlight, we define all persons speaking English "well," "not well," or "not at all" as limited English proficient. The Census Bureau measures only spoken English proficiency. In contrast, states, local school districts, and NCELA generally measure English proficiency in reading, writing, listening, and speaking. Due to the differences in data collection and years for which the data are reported, the absolute numbers of LEP children reported by NCELA and the Census Bureau are not the same. During 2003-2004, 29 school districts accounted for a quarter of all LEP students. About 80 percent of all LEP students reported Spanish as their native language. Sixty-four percent of all LEP children were born in the United States. About 40 percent of foreign-born children were LEP. Latino children made up 66 percent of all LEP children. LEP children are twice as likely to live in poor families compared to children who speak only English or English very well. NCELA estimates that 5,013,539 LEP students were enrolled in public schools (kindergarten through grade 12) in the 2003-2004 school year. This number represents about 10.1 percent of total public-school student enrollment in the United States. The total kindergarten through 12th grade (K-12) enrollment in the United States grew 12 percent from 45,443,389 in 1993-1994 to 49,619,090 in 2003-2004 (see Figure 1). In contrast, LEP enrollment increased by 65 percent from 3,037,922 students to 5,013,539 during the same time period. California had 1,598,535 LEP students in 2003-2004, 32 percent of the nation's total. The states with the next-largest LEP-student populations were Texas (660,707), Florida (282,066), New York (191,992), and Illinois (161,700). See Table 1 for more state information. Between 1993-1994 and 2003-2004, LEP enrollment grew 522 percent in South Carolina, which only recently experienced an increase in its immigrant population. The size of the LEP-student populations declined 11 percent in New York, a state with a long history of receiving immigrants (see Table 1). In the 2003-2004 school year, 29 school districts, each with at least 10,000 LEP students, accounted for 25 percent of the total LEP population. Thirteen of these districts were in California (see Table 2). The top three school districts were Los Angeles (321,149 LEP students), New York City (129,286), and Chicago (82,849). Although NCELA reports that LEP students spoke over 400 native languages (2000-2001 data), 79 percent identified Spanish as their native language. The next most commonly reported native languages were Vietnamese (two percent) and Hmong (1.6 percent). According to the 2000 census, there were 3,786,841 LEP children ages 5 to 18. 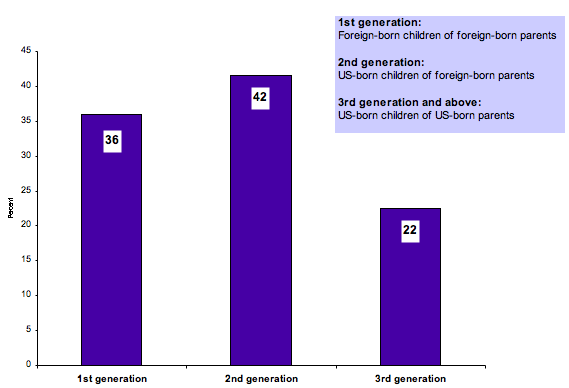 Of those, 64 percent (2,425,885) were born in the United States (see Figure 2). According to the 2000 census, 42.3 percent (1,361,956) of foreign-born children were limited English proficient. Only 4.5 percent (2,424,885) of U.S.-born children were LEP. In 2000, Latinos constituted the majority of LEP children in the nation (65.6 percent or 2,486,708). Note: the Census defines Latinos as those who identify their origins as Mexican, Mexican-American, Puerto Rican, Chicano, Cuban, Central or South American, or who identify themselves as "other Spanish/Hispanic/Latino" regardless of race. LEP students are more likely than either bilingual or English monolingual children to live in families whose income is below 185 percent of the federal poverty threshold. 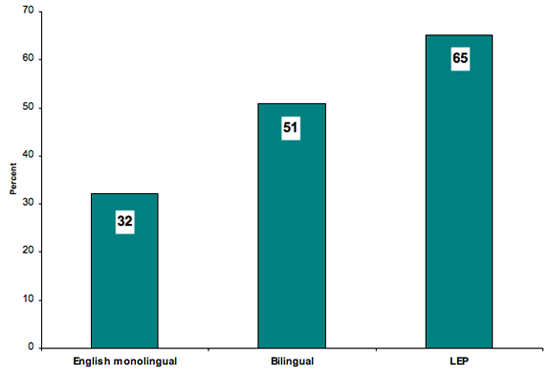 In 2000, 65 percent of LEP children lived in poor families compared to 51 percent of bilingual children and 32 percent of English monolingual children (see Figure 3). Note: The Census Bureau uses a set of pretax money-income thresholds, which vary by family size and composition, to determine who lives in poverty. The poverty threshold for a family of four in 1999 was set at $17,029. To be below 185 percent of poverty threshold, the four-person family, on average, had to have an income of $31,504 or lower in 1999. Potentially bilingual children are defined here as children who lived in households where a language other than English was spoken but who themselves spoke English "very well."